Total industry 2014 crop year shipments for 10 months (August 1, 2014 through May 31, 2015) were down 11% compared to the same period a year ago, but relatively flat compared to the average shipments of the two previous crop years. Shipments to Western Europe were down more, 39% overall; though down only 12% compared to the average shipments of the two previous crop years. * For the current crop year, California shipments were down due to the bumper crop and cheap prices from Turkey, as well as the weak Euro. * The opposite was true for the 2013 crop year. 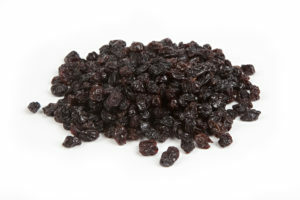 Shipments to Japan were up 17% despite the weak Yen, due to raisins being used in the burgeoning granola and nutrition bar business there. The California raisin grape crop is developing well. While surface water deliveries have been significantly curtailed, nearly all growers have good access to groundwater. However, growing costs have increased. 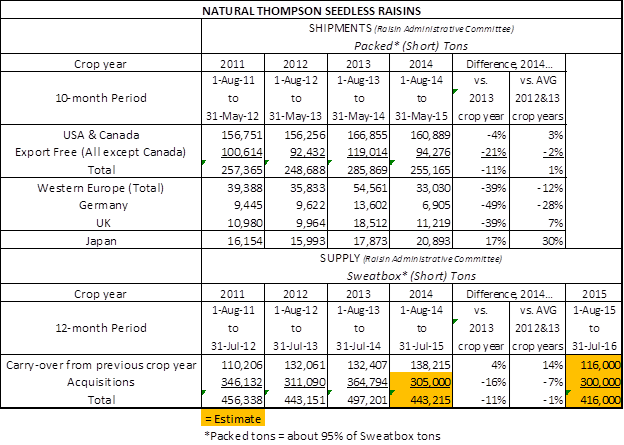 At this point we can anticipate a total supply for the 2015 crop year of around 416,000 short tons vs. 443,000 for 2014. This includes a crop of 300,000 tons for 2015 vs. 305,000 for 2014. Growers are looking to get a greater return this coming season.